Receive TCT's September Love Gift for a donation of any amount. 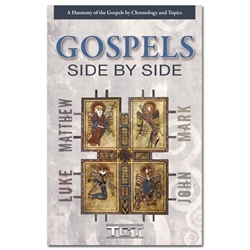 For a donation of any amount this month, receive the September Love Gift, "Gospels Side By Side"
The Bible gives us four biographers for Jesus' life: Matthew, Mark, Luke, and John. See Jesus from four different points of view and learn how their views unite to flesh out a portrait of God. Consult this concise chart to find out where there are four Gospels instead of just one, why three Gospels are similar, but the fourth is very different, how the Gospels complement, not contradict, each other, why most of Christ's story focuses on his last week; and more.